Kona Ocean View Condo - Zapytaj o aktualnych promocjach! Podziwiać fantastyczne zachody słońca na ocean i relaks tropikalnych bryza z tym pięknym przestronnym urządzeniu końcowym z niedawnej przebudowy. Ocean widok z LR, Mistrza BR, kuchni i jadalni. Utrzymany w lekkim Berber. Duży Lanai kafelki wychodzi pola golfowego do oceanu. Basen, jacuzzi i korty tenisowe - 3 sąsiednie kompleksy basenów na nieruchomości. Nieskazitelny teren, gustowne otoczenie, w ciszy i spokoju. Najlepszym fajka plaży jest mniej niż pół mili. Rynku i restauracji w odległości spaceru. Zdjęcie zachodu słońca zostało zrobione z Lanai! Zwrot 100% środków w przypadku anulowania 60 dni przed datą przyjazdu. 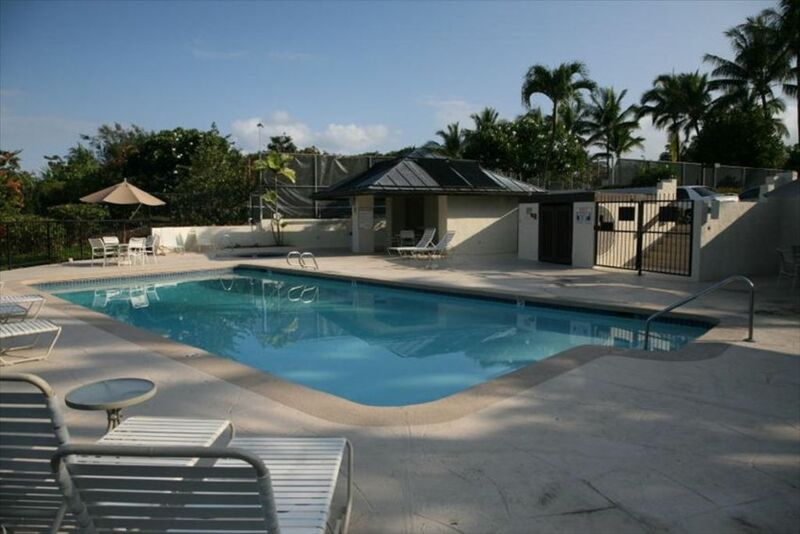 What a great corner unit just feet away from the swimming pool, tennis courts and parking lot. Walking distance to the grocery store, CVS, restaurants, movie theater and the local trolley that will take you downtown for just $2 per person. The lanai (patio) has a beautiful view of the ocean and sunset as well as the golf course. It’s only about a 10 minute walk to Keahou Bay where We found chartered fishing trips, snorkel cruises and our personal favorite, the night time manta ray snorkel adventure (this is an absolute must see). The complex is quiet and tucked away from the main road and truly is in a perfect location. We will absolutely recommend this place/unit to our friends and family and will be booking our next Kona vacation here as well. Happy to know that they enjoyed the same privacy and quiet location that we love so much! The view is absolutely serene and very soothing! This condo is located in a beautiful area with well maintained grounds. Loved having the pool so close. Enjoyed getting in frequently. Being an end unit gives more space and a lot of light. Good ventilation also with fans in all rooms. Located in a great area with lot's to do and beautiful views. Very peaceful and the grounds are very lovely. Overall the condo was nice, well stocked and clean, except the oven was very dirty, looked like it had not been cleaned in a year! Not very private, people walk right past the patio constantly and every morning at 7:45 am they are outside with the blower machine! The owner leaves notes around that make you feel like and intruder instead of a welcomed guest. I would not stay there again. We have many return guests and our condo is booked most of the time as evident by the updated calendar. It is a well maintained condo complex and we are very proud of the well maintained grounds. I did check with our on site maintenance crew and they do use a blower on Monday, Wednesday and Friday around the pool to keep the decking clean, but never before 8AM. The pool is nearby but not so close as to have the noise be bothersome. CCV House rules are posted as required by the complex so that all guests are aware of them and to keep our guests well informed. They are inside of a kitchen cabinet, so not posted as to make the guest feel unwelcome. Will work with my housekeeper regarding the oven. Was just there prior to the last guest and the oven didn't appear to be used often at all and was clean upon my departure, but will definitely check it out to insure guests always arrive to a well maintained and clean property. This is a condo complex, so yes people do walk around the grounds and always have that welcoming Aloha spirit! Counting the days until we return!! Thank you, Jackie, for the last eight years. Since our first stay with you, we look forward to returning to #142 annually. The location is perfect for us. The ground floor location allows easy access, either front or back, to parking, tennis courts and the pool (which has the best view in the complex). We enjoy chatting with guests and owners as they trek to the pool and watching golfers on the challenging 17th par 3 (lava tube) hole. A terrific regional supermarket (KTA), huge well stocked Longs (CVS) and wonderful farmers market is a short 5 minute walk. And Alii Drive (south) to Keauhou Bay provides a wonderful 15-20 minute walk. Jackie, you are an awesome, thoughtful owner, providing virtually every thing one needs (including a small supply of condiments - salt, pepper, sugar, ketchup, mustard and mayo)!!. You are always available to address any concerns and employ terrific cleaning and maintenance folks making sure the condo immaculate and everything is in working order. And your upgrades across the years keep the condo fresh and updated. We enjoy the extra space that the dining area provides (that is available in only a few of the Country Club Villas). We look forward to return in December for another 3+ months and hope to do so for many years to come. It is always wonderful to have someone who understands that this is not just a rental that it is also my home away from home as well. It is always my goal to provide a clean and well maintained property so that others can enjoy it as much as my family does. A great vacation location and just the right amount of relaxation! We've been traveling to the Big Island for several years and this condo is top pick for location, view, ambience, affordability, ease of booking, gracious attentive owner, design details, amenities, cleanliness and easy access. Unlike many other condos, the view is of lush green and ocean without rooftops. It is a quiet corner location near one of the pools and by the tennis court - but there was no noise from either inside the unit. It is beautifully remodeled and has everything necessary to cook, including its own barbecue. The lanai is peaceful, private and well appointed. We very much enjoyed our stay and definitely would recommend it. This was the second time we stayed in the condo. It has been nicely updated. We enjoyed that it was an end unit, which made it more spacious and quiet. This unit is located right next to one of the pools which we often had to ourselves. It is in walking distance to a grocery store and several nice restaurants. The shopping complex has weekly activites such as lei making, etc. The bed in the master bedroom is extremely comfortable. We would highly recommend this condo. Kitchen updates are an added plus and location to stores and movie theaters is a huge added bonus. End unit provides lots of light and the unit is larger than interior units. Rates subject to change. Rents become non-refundable 60 days prior to check in.